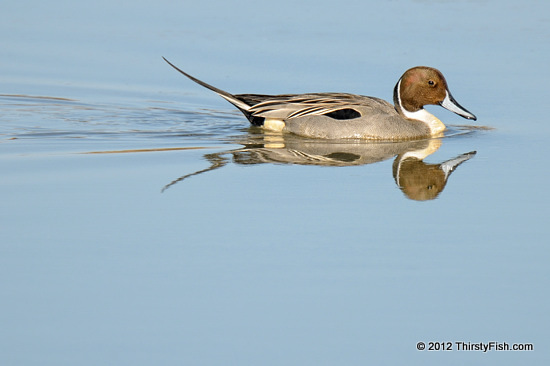 The Northern Pintail is a medium-sized dabbling duck with a slim profile and pointed tail. The male (pictured), is grey with a brown head. It breeds in the northern areas of Europe, Asia and North America. Birds migrate in response to changes in food availability, habitat or weather. They fly at various altitudes during migration, with most at the 500 ft to 2000 ft range. During an expedition to Mt. Everest, a Northern Pintail skeleton was found on the Khumbu Glacier at 16,400 ft. The Khumbu Glacier is the world's highest glacier and is 24,900 ft at its head. It is located in the Khumbu region of northeastern Nepal. A glacier is a large body of ice that accumulates slowly through layers of snow. A glacier slowly deforms and flows due to its weight, carrying with it rocks and debris. Glacial ice is the largest reservoir of freshwater on Earth. Glacial melt-water is important for plants, animals and humans when other sources are scarce. Glaciers have numerous effects on human life, and the widespread retreat and disappearance of glaciers in the last hundred or so years has contributed to a rise in sea levels. There is growing evidence of Global Warming due to human activities. Omnicide is no longer just fiction, but a real and growing existential risk. It is estimated that there are 100,000,000,000,000,000,000,000 (1022 or "ten billion trillion") stars in the universe. During an informal discussion in 1950, physicist Enrico Fermi posed the question: Given the vast number of stars, why have we not seen any evidence of intelligent extraterrestrial life? This contradiction became known as The Fermi Paradox. Although numerous arguments are made in an attempt to answer this paradox, one possible explanation is especially troubling: Civilizations may usually or invariably destroy themselves before or shortly after developing radio or space flight technology.